At the age of 45, Yukio Mishima had written 40 novels, 18 plays, and 20 volumes of short stories and essays. He was Japan's most prestigious writer, sometimes mentioned for the Nobel Prize. Mishima, a man of many roles, was also married, militaristic, homosexual, a body builder, an actor, and a devotee of the Japanese martial tradition. On November 25, 1970, Mishima and four members of the Shield Society, his private army, took over the Ichigaya military headquarters in Tokyo. The troops were assembled to hear the famous writer speak out against what he saw as Japan's decadence. His call for an uprising to assert the country's imperial traditions fell on deaf ears. Mishima then killed himself by ritual seppuku. Mishima: A Life in Four Chapters is, according to director Paul Schrader, not a biographical portrait of the artist but "an interpretation" of his life and work. The drama's four chapters are "Beauty," focusing on Mishima's youthful aesthetic interest; "Art," centered around his vocation as an artist; "Action," in which the accent is politics; and "The Harmony of the Pen and the Sword," which concludes with Mishima's attempt to create meaning through his own death. The film covers the last day in MIshima's life, flashbacks to his childhood and youth, and vignettes from three of his novels — Temple of the Golden Pavilion, Kyoko's House, and Runaway Horses. • Commentary - this archival audio commentary features Paul Schrader and producer Alan Poul. 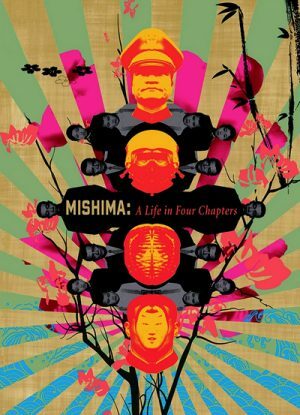 It was recorded in 2006, and initially appeared on Criterion's DVD release of Mishima: A Life in Four Chapters. • The Strange Case of Yukio Mishima - this archival documentary takes a closer look at Mishima's persona and his political beliefs. Included in it are interviews with biographer Henry Scott Stokes, actor Akihiro Maruyama, director Nagisa Oshima, and writer Nobuko Lady Albery, amongst others. Also included is extensive archival footage with Mishima. The documentary was produced by the BBC in 1985. In English, not subtitled. (56 min, 1080i). • Making Mishima - in this archival documentary, cinematographer John Bailey, production designer Eiko Ishioka, and composer Philip Glass discuss the conception of Paul Schrader's film, the image of Mishima that they had prior to committing to the project, the manner in which some of his ideas resonated with them, the unusual portrait of Mishima that the film offers, its form and visual style, etc. The interviews that included in the documentary were conducted exclusively for Criterion in 2008. In English and Japanese, with optional English subtitles where necessary. (44 min, 1080i). • Producing Mishima - in this archival featurette, producers Tom Luddy and Mataichiro Yamamoto discuss the production history of Mishima: A Life in Four Chapters and some specific challenges they faced while launching the project. There are also very good comments about the importance of Francis Ford Coppola's involvement with it. The interviews were conducted exclusively for Criterion in 2007 and 2008. In English, not subtitled. (22 min, 1080i). • Chieko Schrader - Chieko Schrader wrote the Japanese-language screenplay for Mishima: A Life in Four Chapters. In this archival audio interview, she discusses Mishima's persona and legacy and her work during the pre-production process with David Weisman. The interview was conducted in Los Angeles in 2008. In English, not subtitled. (27 min). • John Nathan and Donald Richie - John Nathan and Donald Richie had contacts with Mishima. (The former worked closely with him on the translation of The Sailor Who Fell from Grace, while the latter met him during his first visit to New York in 1952). In this archival interview, the two discuss his persona, legacy, and some popular myths and half-truths about his radicalization and death. The interview was conducted in 2008. In English, not subtitled. (27 min, 1080i). • Mishima on Mishima - presented here is a short segment from the French TV series A la vitrine du libraire in which Mishima discusses the evolving nature of post-war Japanese literature with journalist Jean Prasteau. The interview was conducted on January 15, 1966. In French and Japanese, with optional English subtitles. (7 min, 1080p). • Trailer - vintage U.S. trailer for Mishima: A Life in Four Chapters. In English, not subtitled. (2 min, 1080p).